Imagine it’s 4.30pm on a weekday. Are you allowed to park here? if so, how long for? This is a great example of disinformation design from Haringey council in North London. 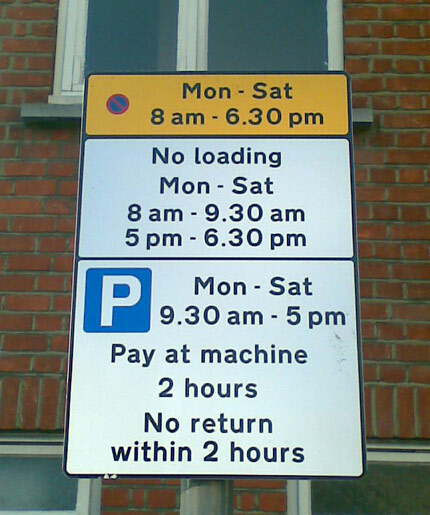 Because the council profits from poor information design, this sign is unlikely to ever get fixed. I’m sure we’d all love to be in a position where bad design makes you MORE money. But of course that never happens on the web, does it? Or does it? Haringay council are the worst for this kind of thing – and their ticketers are paid on commission! It’s a money-making machine, they don’t really care about the parking conditions. Anonymous – that’s what I thought! I am now the proud owner of a Â£100 ticket which was issued at 17.14pm. You might want to challenge it. Seems to have worked in Scarborough. Thanks for the pointer Tom, I am challenging it now… Fingers crossed!